"Our ideal is to be a church in which Christ is honoured through a fellowship of liberty and unity of love. Within a framework of basic Christianity, doctrinal variations are not to divide the church. The right of every believer to his own position is to be respected." Although Commons Church was founded in 2014 we have the privilege of rooting ourselves in two significant histories. First the history of the Evangelical Covenant Church; from its genesis in Sweden, to birth in America, and subsequent growth into the multi-ethnic denomination we participate in today. And second, the history of the Scandinavian Mission Church in Calgary AB; founded from roots in the Swedish Mission Friends in 1911, moving to the Kensington community in 1952, and merging into the launch of Commons Church in 2014. This section of the site will trace both of these stories as part of our shared history. Though headquartered in the United States, the Covenant Church traces it roots back to Sweden. While the state Lutheran church dominated much of the religious and social landscape in 19th century Sweden, the English evangelist George Scott, found significant traction for his Wesleyan preaching there. Eventually forced to leave Sweden after comments critical of the state church, the revival work continued under the leadership of Swedish pioneers like C.O. Rosenius. 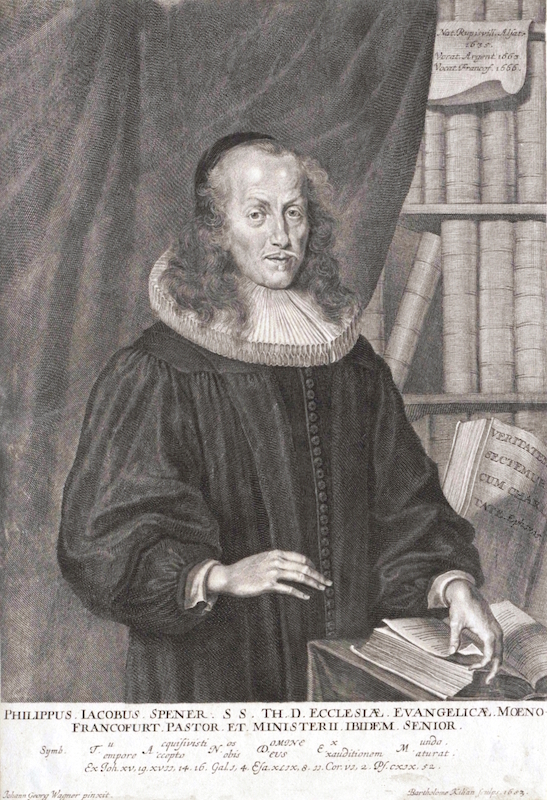 While Rosenius was not a trained minister he had been influenced by the Moravian tradition in a way similar to Wesley. These early "mission friends" that rallied around Scott and Rosenius, were heavily influenced by the previous pietist revival that had been suppressed by the Swedish state in the 18th century. This recaptured pietist focus on a personal encounter with the spirit of God flourished under Rosenius' leadership who was eventually succeeded by P.P. Waldenström. Though Waldenström was initially committed to working within the state church, he created two significant controversies that lead to the formalization of the Mission Covenant Church in 1878. First in 1872 Waldenstrom writes a sermon arguing that because God is love and since God cannot change, the atonement cannot be an event that moves God from wrathful to loving. It can only be an event wherein God changes something in us. This seems to conflict with the Augsburg confession (1530) on which the Swedish state church was founded. Later in 1876 he serves the eucharist at a gathering despite the fact that the State Church did not allow anyone to administer or receive communion outside an official state church. Although an ordained minister Waldenström maintained the pietist perspective arguing that any gathering of believers was in fact a church regardless of location or sanction. These controversies contribute to the Mission Covenant Church being formed independent of the theology of the Augsburg confession on which the state Lutheran church was based. These events had ripple effects as the pietist spirit was carried to America through Swedish immigrants who had moved across the ocean. As early Swedish immigrants attempted to establish churches and coordinate their efforts in their new home, existing Swedish synods, now influenced by Waldenström, began looking at new ways to organize with more freedom. The tension was now in how to organize such a church. Some preferred a minimal structure that preserved the freedom of the local congregation but also provided for the support and accountability of a denomination, others were adamantly opposed to any structure, seeing it as a return to the restrictions of the state churches in Europe. Eventually a number of the early Mission Friends did form a new denomination in 1885 called the “Swedish Mission Covenant Church” and those opposed to the formation went on to play significant roles in the founding of the free church movement in America. During the early 20th century the founding concepts of the denomination were quickly put to the test. The fundamentalist controversy that overtook much of American religion hit the Covenant as well. New advances in geology, biology and biblical criticism had left many Christians feeling adrift and the solution for many seemed a hard, almost militant defence of what became known as the fundamentals. Northpark University in Chicago (1894) had been recently founded in order to facilitate the education of ministers in the Covenant and took a progressive view incorporating a liberal arts educational into the curriculum. Even as pressure mounted to affirm a particular hardline posture on the fundamentals, the university and the denomination held true to the founding principles of the Covenant affirming a commitment to the centrality of scripture but also to the freedom of believers to disagree on the specifics of Christian faith, stepping back from more divisive language like the "verbal inspiration" of scripture. In 1936 the name of the denomination was changed to the Evangelical Mission Covenant Church reflecting a Swedish immigrant population that was moving into a second generation where the distinctive Swedish elements had begun to give way to a more American identity. 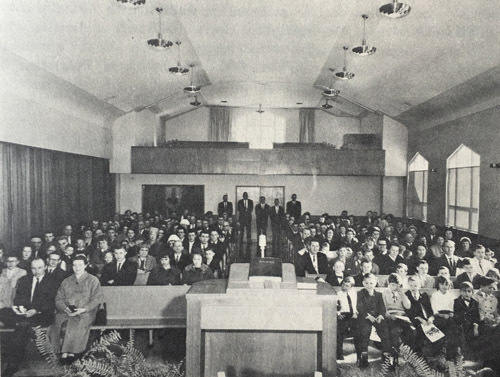 An emphasis on church planting expanded the foundation of the denomination and a strong commitment to the American civil rights movement led to a purposefully multi-ethnic denomination that is today able to celebrate the immigrant part of our history even as the Swedish heritage has become less central. • We affirm the centrality of the word of God. • We affirm the necessity of the new birth. • We affirm a commitment to the whole mission of the church. • We affirm the church as a fellowship of believers. • We affirm a conscious dependence on the Holy Spirit. • We affirm the reality of freedom in Christ. The Canada Covenant, having been formed in 1904, quickly began to take note of the significant number of Swedish immigrants moving into the Calgary area. By 1909 the Canada Covenant had brought in Rev. Johnstone from Pennsylvania to explore the possibility of whether a Covenant Church could be started in the area. While it was decided that a church plant might be too ambitious a Sunday School was established in the Bridgeland neighbourhood. However, because Johnstone was only brought to Canada for a three month exploratory project the Sunday School lapsed soon after he departed. In 1911 the presidents of the Canadian Covenant G.E. Bjorklund and the American Covenant H.J. Hjarpe decided to move forward with the founding of a Calgary church. Thirteen charter members, many of whom with roots extending back to the Mission Friends movement in Sweden, formed the Scandinavian Mission Church in Calgary. Later that year C.A. Jacobson [photo above] of Minneapolis was called as the first pastor of the new community. The church began meeting in rental facilities but by 1912 a lot was secured on the corner of 5th Ave and 5 St SW for the price of $10,000. Of course, the sum seems fantastically small today for property in downtown Calgary but this was actually during a pre war boom period in Calgary’s history and the cost was considerable for the young community. 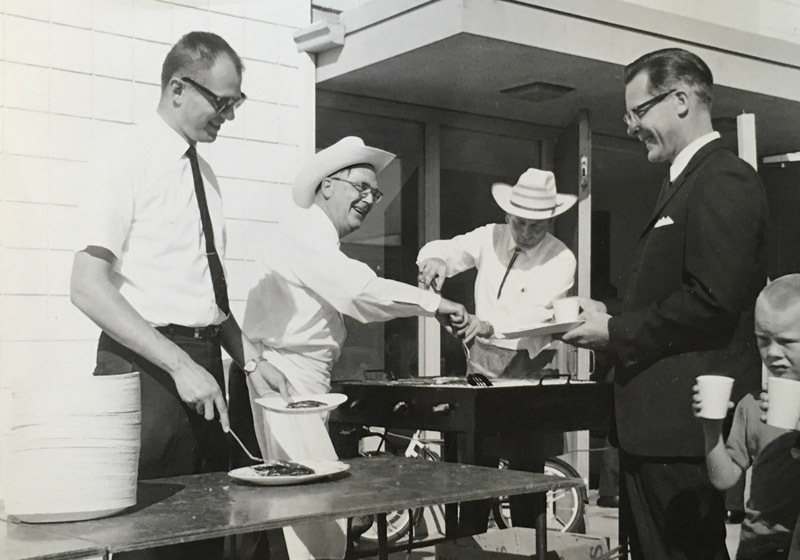 With finances stretched so tightly the initial building was built entirely by the community under the direction of a community member, a Mr. Lindstrom. The beginning of the war presaged a considerable movement of Swedes from Calgary to the United States and when Jacobson was eventually called to be the Superintendent of the Canadian Conference in 1915 the church was left without a resident pastor. Apart from some short term pastorates, all less than a year, the Church remained without a full time minister from 1915 until 1926. That year E. Gillstrom, who had previously been a missionary in China, accepted a call to Calgary. He remained as pastor until 1931. During this period the church was officially incorporated under the name “Scandinavian Mission Church” (1928) reflecting it’s still predominantly Swedish makeup. However in 1932, the first English services were begun in the church on Sunday nights as a way to reach out to the larger community and perhaps some of the second generation children. By 1937 the congregation had adopted English as the default language and in 1942 the name of the church was changed to “Mission Covenant Church”. With the community growing again a decision was made to start a Sunday school in the Kensington area on the north side of the river. It was to be called “Kensington Covenant Sunday School”. Four connected residential plots were purchased from the city for $2000 in 1952. Though the Kensington neighbourhood is now a core urban neighbourhood in the city, in the 1950s the north side of the river was largely farm and suburban real estate. Herman Hornstrom, one of the charter members of the church, was elected chair of the building committee and assisted in the initial architectural designs. 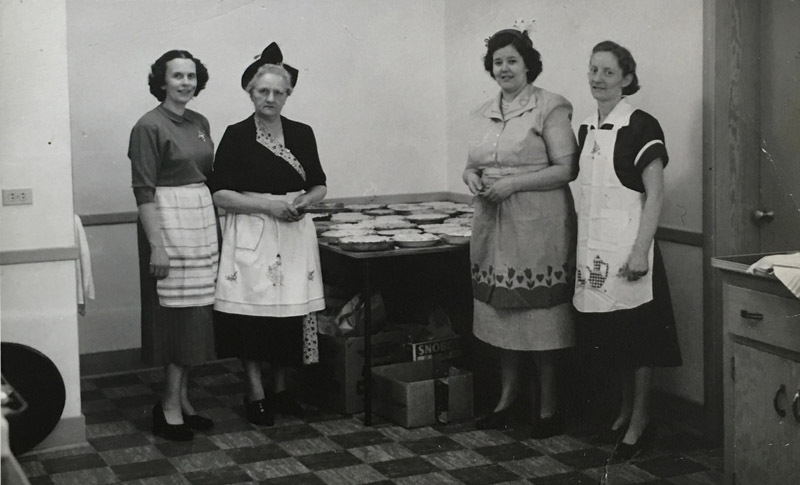 By 1955 the new church was opened and the old building was put up for sale, with the community moving fully to the Kensington neighbourhood. In 1956 the 5th St building was sold for $40,000. Things were booming, and the city of Calgary was expanding rapidly in the post war period. The new church was well positioned in a fast growing neighbourhood. Only three years after the new church was opened an Extension Committee was formed in 1958 to explore the possibility of adding on to the building. 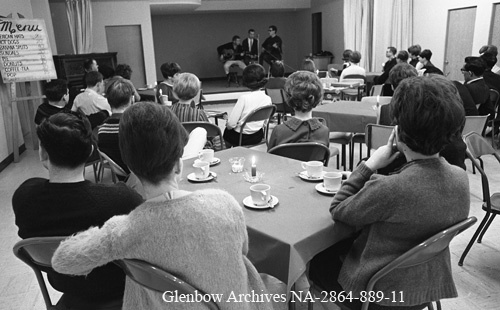 During this period the name of the church was changed again in 1959 to “Evangelical Covenant Church of Calgary” to reflect the equivalent change in the name of the larger denomination. by 1960 the Kensington building was completely paid off and a renewed commitment to an extension was made. The “Christian Education wing” which included the gymnasium and new children’s classrooms was finished in 1962. The Kensington church grew rapidly becoming the largest church in the Canadian conference. Two attempts to plant Covenant churches from out the Kensington community were made however, both attempts folded in the 1980s. The Kensington church endured a split in the late 80s and continued to decline throughout the 90s and early 2000s when the church adopted the public name “Kensington Road Church” in an attempt to better connect with the surrounding neighbourhood. 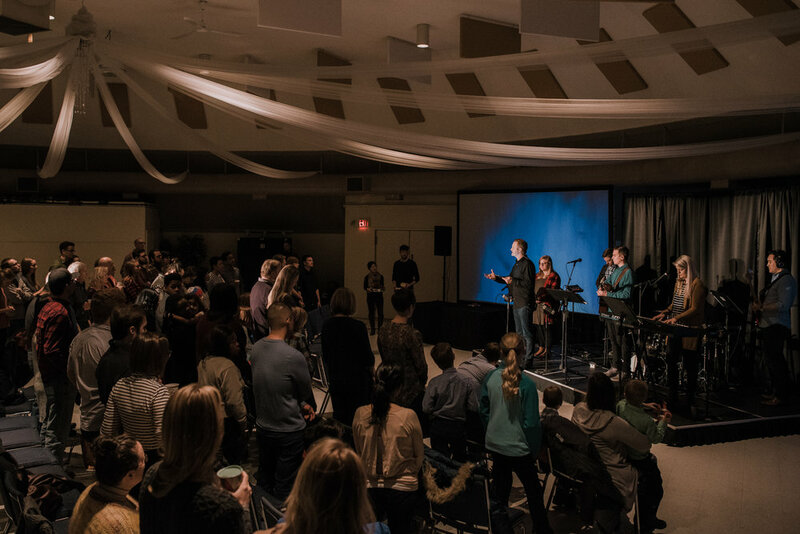 In 2014 a young community that was being planted out of Westside King’s Church in the SW of Calgary began discussions about joining the Covenant denomination. During these conversations introductions were made to the Kensington Road Church. After initially exploring the option of renting space from the church it was decided that perhaps a deeper partnership should be explored. A committee was formed by Kensington Road Church to explore the possibility of merging with this new church plant. In May of 2014 the 21 members Kensington Road Church voted unanimously to join with the new church plant and Commons Church was launched later that September. On the first week of the newly launched church over 300 people attended the first service. The next week a second Sunday service was added. By the first anniversary Commons had moved to three services and in the third year since launching the church had added a fourth Sunday service. Parish is an old word for a neighbourhood church. As Commons has grown we remain committed to our presence in the local neighbourhood. This is why we have expanded into a network of connected parish communities. This means each parish shares the central vision, mission and DNA of Commons but also has its unique features like leadership and teaching that is local to the neighbourhood. In January 2018 Commons launched a second parish meeting in the Inglewood Community Hall. Peter Enns. The Sin of Certainty: Why God Desires Our Trust More Than Our "Correct" Beliefs. New York: Harper Collins, 2016. Donald C. Frisk. Covenant Affirmations: This We Believe. Chicago: Covenant Publications, 1981. Keith C. Fullerton. One Hundred Years: The Evangelical Covenant Church in Canada. Winnipeg: The Evangelical Covenant Church in Canada, 2004. Karl A. Olson. By One Spirit. Chicago: Covenant Press, 1962. P.P. Waldenstrom. “Sermon for the Twentieth Sunday after Trinity,” in Covenant Roots: Sources and Affirmations 2nd Ed. ed. Glenn P. Anderson. Chicago: Covenant Publications. 1999. Local historical documents including: Bulletin from the 50th Anniversary (1961), Bulletin from the Dedication of the Educational Unit (1962), Certificate of Incorporation under Alberta Religious Societies Act (2004), Special Congregational Meeting Minutes (May 2014), Annual General Meeting Minutes (2014).